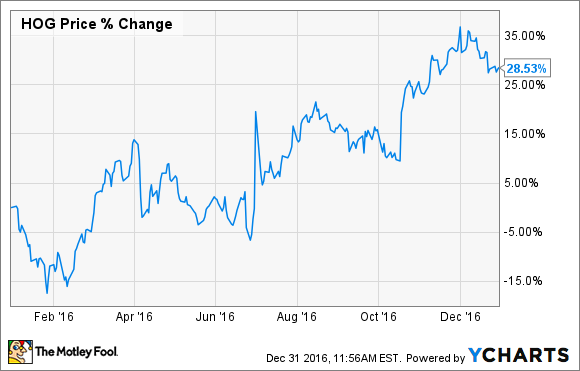 Did Harley-Davidson Stock Deserve to Be Up 32% in 2016? The big bike maker's stock had a big year, but it may be setting it up for a big fall. Considering Harley-Davidson (NYSE:HOG) hasn't been able to sell more motorcycles from one year to the next for the past two years, the fact its stock has grown in value by 32% in 2016 should cause investors pause to consider if the increase was justified. Harley-Davidson motorcycle shipments have declined 26% since they hit a record high of 361,600 in 2006, coming in just over 266,000 bikes last year, and are forecast to register somewhere between 264,000 and 269,000 motorcycles for 2016. That's likely just wishful thinking, because if we extrapolate the sales Harley has made over the first three quarters of the year, it looks as if it will miss those targets by a wide margin. Motorcycle revenue fell 3% in the third quarter to $789 million, while unit sales in the U.S. market, which represents two-thirds of its total business, tumbled 7% for the period. And despite holding the line on the discounting rival Polaris Industries (NYSE:PII) and others in the industry were engaged in to steal or maintain market share, profits fell 7% on a per-share basis. Yet that's only because Harley's heavy share repurchases are masking the true impact of its stumbling business. Buying back millions of shares concentrates the bike maker's net profit among the fewer number still outstanding. Image source: Flickr via Nacho. Since 2011, Harley-Davidson has reduced its diluted outstanding share count by some 56 million shares, or 24%, while it's reduced its shares outstanding by some 25 million in the past year alone, or nearly half the five-year total. The motorcycle maker also borrowed $750 million to buy back 14 million shares in 2015. The immediate, practical effect of the buybacks is it boosts per-share profits. For example, had the share count last quarter been kept constant from the year-ago period, Harley would have posted earnings of $0.56 per share instead of the $0.64 that it did, an increase of 12.5%. The question investors have to ask is, did they get their money's worth? There are very valid reasons a company will buy back its stock beyond just engaging in financial gymnastics. For one, it's an easy way to reward shareholders, whose slice of the ownership pie grows larger as the size of the pie shrinks. It can also be a good investment for the company if it buys its shares low and the value increases. For instance, Harley repurchased 2.1 million shares in the third quarter at a cost of $104.6 million, or an average of about $50 a share. With the stock currently sitting above that level, it would seem it got a good deal. Same also with the purchases made in the second and first quarters, too, where it paid an average of $46 and $42.50, respectively. The problem is, based on its sales record and the problems confronting the industry, its stock really doesn't deserve to be trading at $59 a share, even if that translates into just 14 times next year's earnings estimates. Where its earnings might have grown at a rate of about 27% over the past five years, they're forecast now to grow just 9% annually over the coming five years. That means Harley's stock price, in relation to its earnings and their projected growth rate, is overvalued. It also trades at over 21 times the free cash flow it generates, suggesting again it's no bargain..
Polaris Industries has been smoking its tires, posting double- and triple-digit sales growth for its Indian Motorcycle brand, while Harley's sales have fallen. Much of that exponential growth came as a result of Polaris starting from a nearly nonexistent base, since it bought the nameplate out of bankruptcy a few years ago, it's clear its business has gotten traction and expanded while Harley's has shrunk. The motorcycle industry is in the midst of a slowdown, one that even Polaris is feeling. On its third-quarter earnings call with analysts, Polaris CFO Michael Speetzen forecast that motorcycle sales would only rise by low-single-digit percentages, which is lower than was previously expected, because of the spreading weakness in the industry. Harley said it was causing it to "streamline our operations to be even more focused, aligned, and agile." So what we're looking at is a motorcycle manufacturer that consistently pumps out more bikes than the market can handle while its own sales fall. In short, the discount Harley-Davidson got for its shares when it bought back its stock was unwarranted because their subsequent increase in value wasn't justified based on its business. With the bike maker's fourth quarter now at an end, if sales are as bad as expected -- not least because it's historically one of its weakest quarters -- it doesn't bode well. The gains Harley-Davidson recorded in 2016 may soon vanish.